Sgt O’Brien sent an email about how beautiful the night sky was in Afghanistan. I wish I could see the brilliance of the stars the way he can. He said the stars and the mountains were the prettiest he had ever seen. 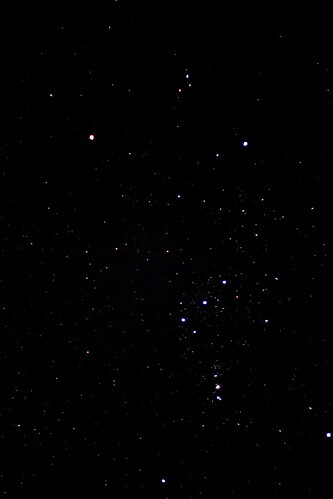 There is no light pollution and the stars look like jewels dumped from a velvet bag. He said the mountains were sharp and bare of vegetation. The combination of the stark mountains, the vast sky and the quiet was awesome. The closest I can come to Afghanistan is Flickr. Looking at these pictures remind me that we live in a desert with beautiful mountains as well. I love how big the sky is here and at night I can see more stars than I could on th East Coast. I want to go stargazing and soak up the big sky. Maricopa County shares their stargazing schedule online. The talks are hosted by the husband and wife team of “Star Gazing for Everyone” Tony and Carole LeConte. This hard working couple puts on over 300 shows a year and their passion is star gazing. I read about them online and it’s time to meet them in person. The LeConte’s travel all over the valley visiting regional parks, you can find a show near your house. The shows are best for children aged 6 and up. Look through telescopes (setup for your viewing pleasure) and enjoy a slide presentation under the stars. Learn the names of stars, see the constellations, and listen to stories of the night sky. When visible, view the craters of the moon, Venus, Mars, Jupiter, and the rings of Saturn. Bring lawn chairs or blankets for your comfort. Information about the Challenger Learning Center of Arizona will be provided. Bring your own binoculars if you have them. The Riparian Preserve in Gilbert has an observatory. The programming is run by the East Valley Astronomy Club. They are open the second Friday of each month or by appointment. This post is East Valley centric, but it should serve to give you an overall idea that star gazing is popular and accessible all around the valley. For more star gazing resources, check out this list of local astronomy clubs. 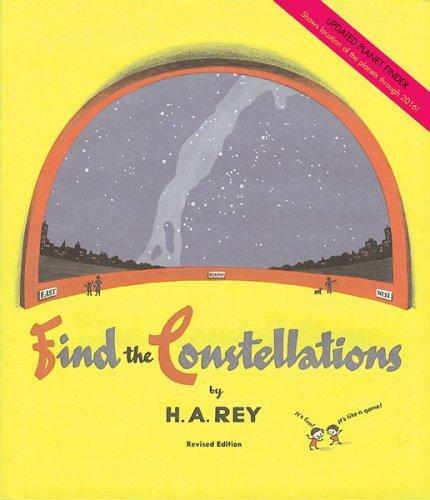 Librarian Note: My favorite book for children on stargazing is, “Find the Constellation” by Curious George author H.A. Rey. Another unique to the Valley place to visit is the unwieldy named Lunar Reconnaissance Orbiter Camera (LROC) Visitor Gallery, located in the Interdisciplinary A building on ASU’s Tempe campus. 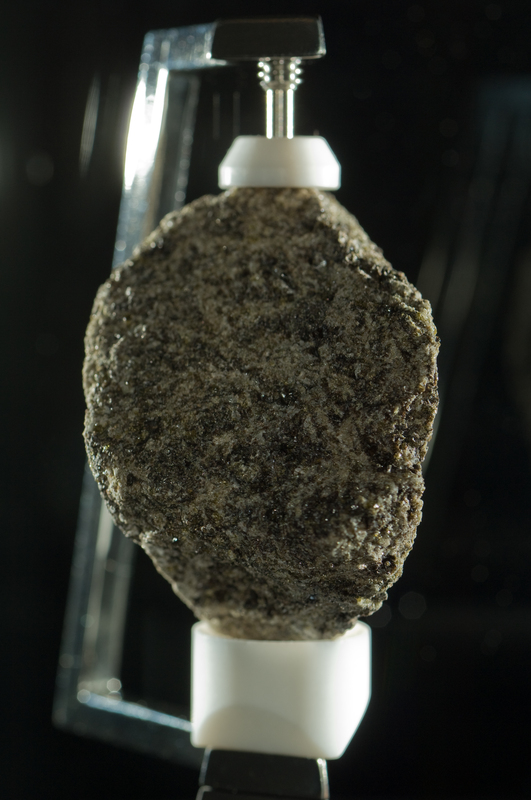 You can view a piece of moon rock that is on long term loan and is billions of years old. Kind of awesome and of course, free. This is definitely going on my list of beat the heat destinations this summer. To get a map customized to the date and location, enter your address on the longitude and latitude finder at touchmap.com. Then plug that data into the Starry Night Sky Chart and voila, a personalized map of the constellations for tonight. If you have an ipad or iphone consider the Star Walk 5 Stars Astronomy guide. It labels the night sky when you point your screen at it. Amazing. Activist Note: Phoenix was once considered one of the best places in America to see the night sky. With the increase of light pollution the folks at darksky.org are fighting to keep our stars bright. I was surprised to learn that digital billboards are sources of light pollution. Dark sky conservation might be an interesting topic for a student science fair project. AZ Republic published a recent article about the fight to keep the skies dark. This morning I put on my father’s Vietnam Era jacket. It’s made out of a poncho liner and is embroidered with the insignia of the 173rd Airborne. It has his year of service in Vietnam, 67-68 and a tiger on the sleeve. I wore the jacket during the 5k Honor Walk. Participating in any 5K walk is a good way to spend time together as a family. You show your support for a cause that matters to you, and you mingle with your community. In our case, Veteran’s issues are close to my heart. My father’s military service raised him out of poverty, provided him with a college education and he spent the final years of his life in a VA home. He gave hundreds of hours in community service as a Veteran. Growing up, he brought his children to parades, picnics, volunteer events and military museums. I feel more connected with him when I go to these events. I’m proud to wear his jacket in his memory. The walk was an easy paved course through the campus of Grand Canyon University in the West Valley. 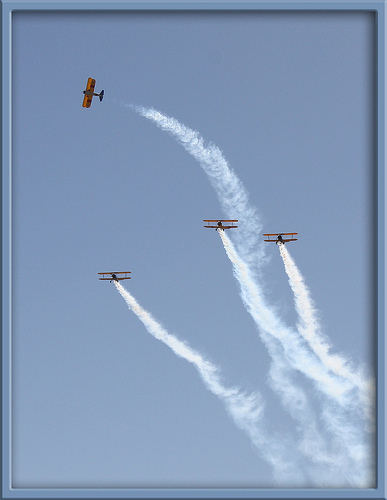 The organizers put together a superlative ceremony with pipe and drum band, Stearman bi-plane flyover, model of the U.S.S. 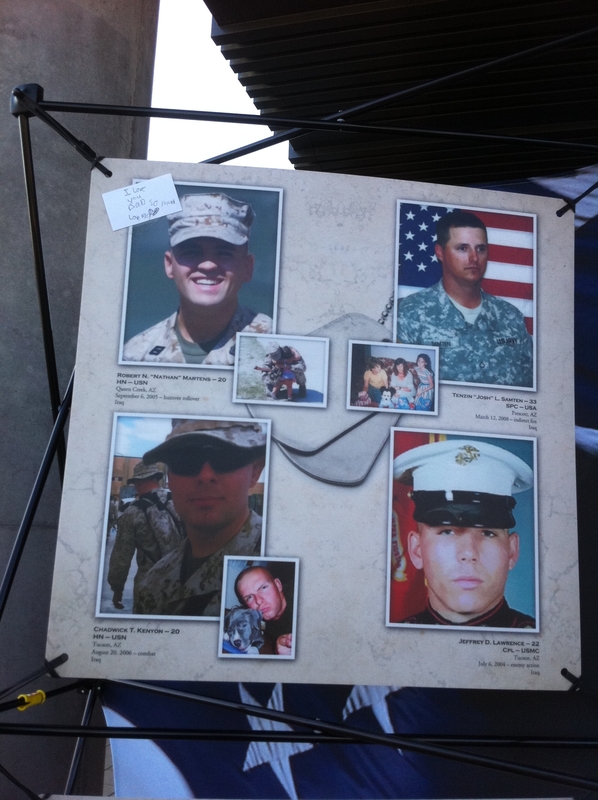 Arizona by Patrick and Cecil Gates, WWII era jeep and the moving display of the Wall of the Fallen, a pictorial display of all Arizonans who made the ultimate sacrifice in the post 9/11 conflict. 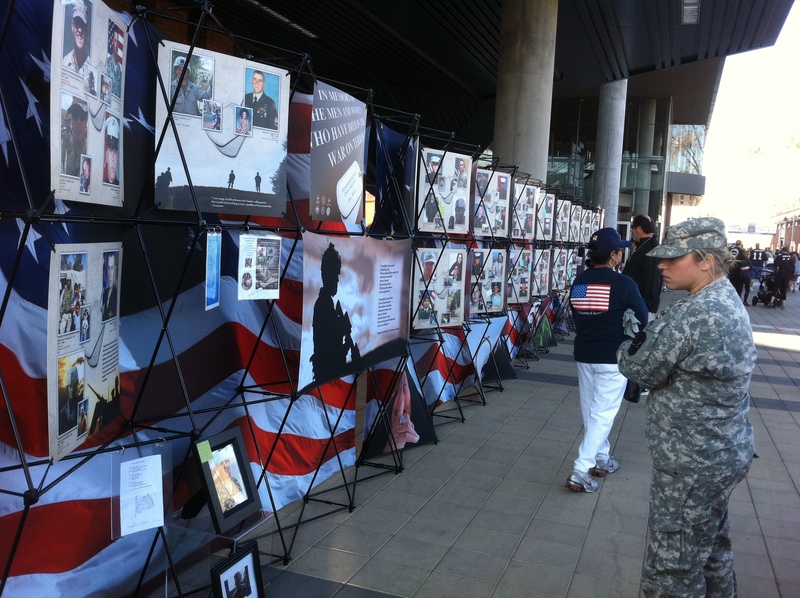 To learn more about this exhibit you can follow it’s schedule online at Remembering our Fallen. I highly recommend 5K walks for any cause you hold close to your heart. My dad would want me to remind you to say Thank you and Welcome home to the Vets in your area. I wasn’t in school today. I had a VIP in town and I wanted to take him to my favorite place, Taliesin West, the desert studio of Frank Lloyd Wright. Taliesin means “Shining Brow” in Welsh, he named the house so because he situated the home in the brow of the hills. FLW attached to the idea of the “brow” as the only place to build on a hillside. Not at the top, not at the bottom, but set high in the brow, snug below the crown and let the valley fall below. When you stand at the prow of Taliesin and watch the desert unfold below and away from you on all sides, you can feel his genius. Sgt. O’Brien is home from his second tour of duty in the Middle East and this is where he picked to visit. As we walked in front of the property with the mountain behind us and the city below us, we came to a point in the yard shaped at right angle. She said that Wright stood there and proclaimed the desert looked like the bottom of the ocean to him. In the bright sunlight, with the brown and green and utterly dry plants sprawled in acres before us, I saw it. It lookedd like an ocean floor. If you stand on the corner and turn and look at the house behind you, you can imagine you are on a ship sailing across the ocean of the desert. Epic. 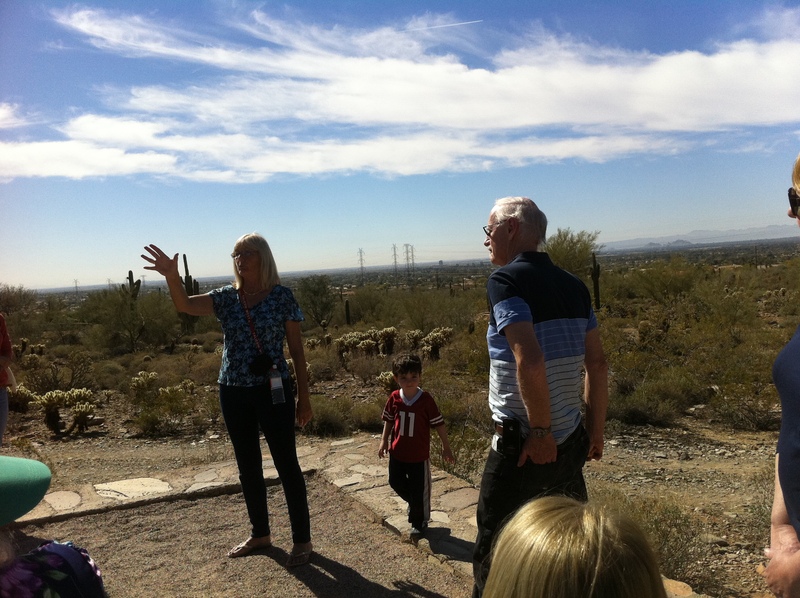 My action photo of the tour guide pointing out the corner of the property as a “prow.” Take a look at the desert, does it look like the floor of the ocean? I thought that was so cool. My picture is lame but the idea is very cool. Mr. Wright’s mother was Welsh and she raised him with stories that someday he would grow up to be an architect. I love that. This is one of the best house tours I’ve been on because so much of FLW is invested in this property. I’ve toured Falling Water and his home in Oak Park, Taliesin West is the most interesting to me. If you have an opportunity to visit I recommend it. After our tour we had lunch at Pita Jungle in Scottsdale, which is close by and has healthy, reasonably priced food. A great day all around. The tour ends in the Taliesin theater. 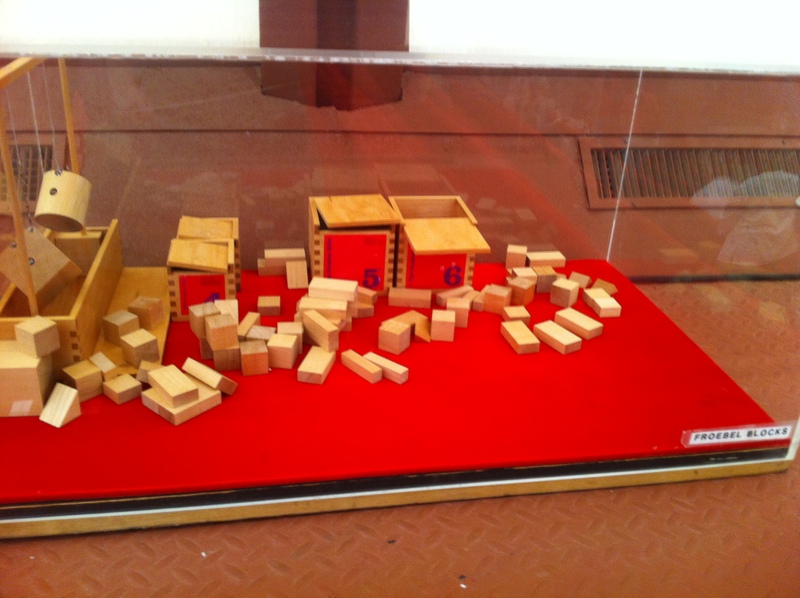 On the way to my seat I saw a small display of Froebel blocks that his mother bought him when he was a boy. I snapped a pic, this is an easy way to make a subject like FLW relevant for my students. I can talk about Lincoln Logs or Froebel blocks. I am a big believer in the power of childhood play and the importance of open-ended toys and large blocks of non-directed time to create. According to my superficial research on home page of Wisconsin Historical Society, he was originally named Frank Lincoln Wright, but his mother changed his middle name to Lloyd after her divorce. His adult son John Lloyd Wright was the inventor of the enormously popular Lincoln log toy set. 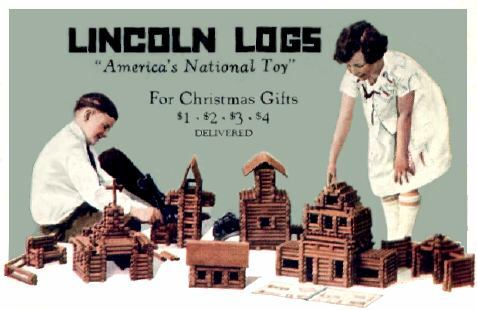 I love the double trivia behind the idea that Lincoln Logs were named for Abraham Lincoln and Frank Lloyd Wright. I want to like black beans but my prejudice against beans is too strong. If a meal has beans in it, I pick them out or refuse, like a child. Well, that is not working for me. Beans are healthy, I’m not a kid anymore and I can’t eat whatever I want. Time to learn to love beans. As in, man, I wish I could eat something with beans in it right now! Not just like beans. Love the bean. Thanks to my girlfriends Rita and Cari, I’ve had two dishes that feature black beans and both were home runs. The recipes are at the end of the post. They are both addicting and even you bean haters will love them. My friend Rita is the talented chef at Province . We had girlfriend “soup night” where we all made a big pot of soap to freeze and in enjoy in lunches later. I used my good manners and when the group said “Let’s make Turkey and Black Bean Chili” I said “sounds good” but I did not mean it. I was thinking, well, that’s a soup I’ll pass on. I happily ate my words later. I made the recipe myself at home for my family. My bean hating husband loved it too. I credit my conversion to mixing fresh diced avocado and cilantro in the chili at serving. Does this picture make you want to say No thanks? 1. In a large pot, cook ground turkey in a few tablespoons of olive oil, making sure to break it up into small pieces. 2. Add diced onion, peppers, and garlic. Season lightly with salt and pepper. Cook for 5 minutes. 3. Add cumin and chile powder and stir until it coats the turkey and meat completely. 4. Add tomatoes and black beans. Stir. 5. Add chicken stock until desired consistency is achieved. Cook for at least 30 minutes, simmering to get the flavors to develop. Adjust seasoning if needed. 6. Right before service, add cilantro to chili and stir through. 7. Plate and garnish as desired. Mix first ingredients. Mix sauce separately and pour over the bean mixture. 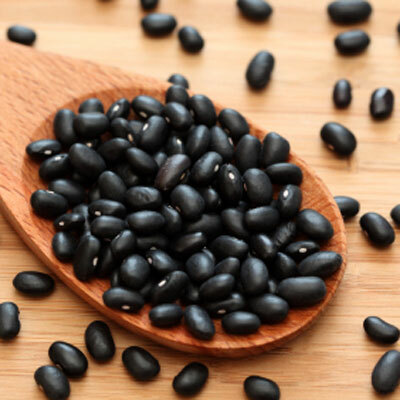 Refrigerate for a few hours before serving for best results–the black beans soak up the flavor. Serve with tortilla chips (or scoops, you are going to want to scoop this one up!) Recipe can be doubled or tripled easily. As a reminder to me, two more to try. Cowboy Caviar (with pineapple) and Cowboy Ciao (From Scottsdale restaurant of the same name). 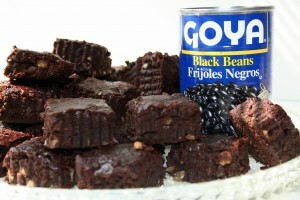 I guess it’s time for me to tackle brownies with the black beans inside. What are your favorite bean recipes? Are you a bean hater? One of our library volunteers brought in a book to read today. 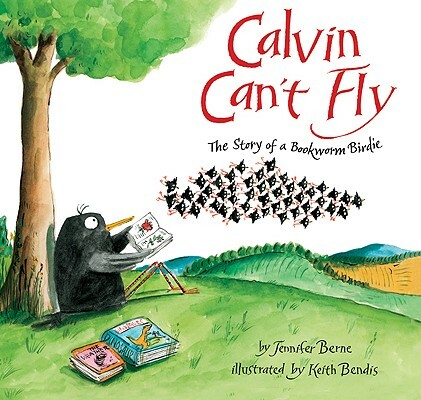 It is called, Calvin Can’t Fly: The Story of a Bookworm Birdie. And that’s when I recognized the starling from my memory. I snapped off this picture in PA when I pulled over to photograph a farm. I think these are starlings. I used to see beautiful flocks of birds who undulated in waves and loops in unison, like a school of fish but in the air. I looked around a little more and found a video to show my kiddoes and had a ball scrolling through legions of starling flock pictures on Google Image search. If you like, you can make a bird stamp out of potatoes, draw a free form shape and then stamp a flock of starlings inside. 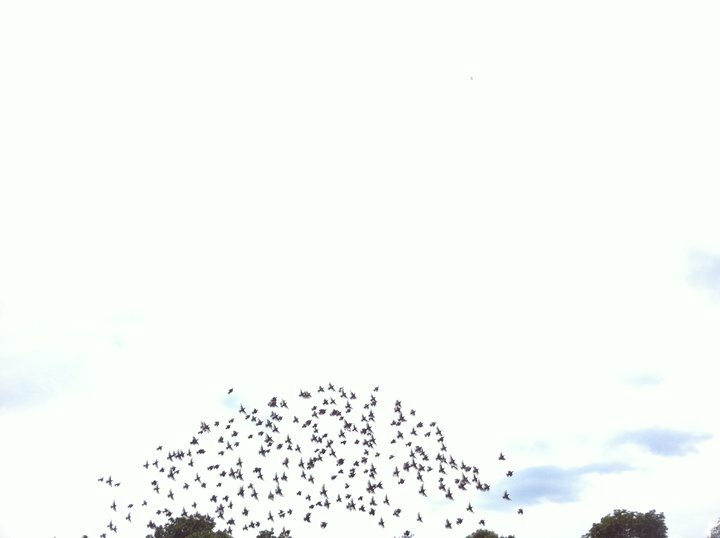 To watch the uncanny synchronization of a starling flock in flight is to wonder if the birds aren’t actually a single entity, governed by something beyond the usual rules of biology. New research suggests that’s true. Mathematical analysis of flock dynamics show how each starling’s movement is influenced by every other starling, and vice versa. It doesn’t matter how large a flock is, or if two birds are on opposite sides. It’s as if every individual is connected to the same network. That phenomenon is known as scale-free correlation, and transcends biology. The closest fit to equations describing starling flock patterns come from the literature of “criticality,” of crystal formation and avalanches — systems poised on the brink, capable of near-instantaneous transformation. In starlings, “being critical is a way for the system to be always ready to optimally respond to an external perturbation, such as predator attack,” wrote researchers led by University of Rome theoretical physicist Giorgio Parisi in a June 14 Proceedings of the National Academy of Sciences paper. Parisi’s team recorded starling flocks on the outskirts of Rome. Some had just over 100 birds, and others more than 4,000. Regardless of size, the correlations of a bird’s orientation and velocity with the other birds’ orientation and velocity didn’t vary. If any one bird turned and changed speed, so would all the others. In particle physics, synchronized orientation is found in systems with “low noise,” in which signals are transmitted without degrading. But low noise isn’t enough to produce synchronized speeds, which are found in critical systems. The researchers give the example of ferromagnetism, where particles in a magnet exhibit perfect interconnection at a precise, “critical” temperature. “More analysis is necessary to prove this definitively, but our results suggest” that starling flocks are a critical system, said study co-author Irene Giardina, also a University of Rome physicist. According to the researchers, the “most surprising and exotic feature” of the flocks was their near-instantaneous signal-processing speed. “How starlings achieve such a strong correlation remains a mystery to us,” they wrote. As a child, you don’t decide where you go–you just find yourself places. As a bookworm, I spent hours in front of the bookshelves of my friends and neighbors. 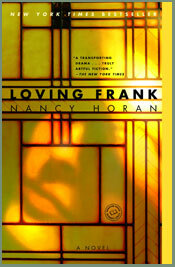 Bookshelves are so personal and the books I reread were like friends to me. My grandmother’s shelf had book of the month club best sellers, Ernie Pyle, Reader’s Digest condensed books, and old popular humor like Art Linkletter and Erma Bombeck. My dad had his Ian Fleming, the musically named John LeCarre, Alistair Maclean, Time Life World War II Series and giant coffee table books about “The Very Rich” where I learned about Hetty Green “The Witch of Wall Street”. My next door neighbor had Wodehouse, W.P. Kinsella, John Mortimer. When I think of the people I loved as a child, I think of their bookshelves. Bookshelves are going away. They are a luxury, not a necessity. I won’t bemoan this. Bemoaning does not serve. I like e-readers. One of the great things about e-readers is more books with you all the time–I mean, all of Dickens for $1.99? E-readers are a font of old books for a bookworm like myself. I had this weird impulse to find a lost book that Churchill read, in a few minutes I had a .99 copy of Lytton Strachey’s Queen Victoria. I love how an e-reader will connect me to a lost popular culture book like Camping and Woodcraft by the naturalist, Horace Kephart. What a slice of life that book is. The downside of e-books is the end of the bookshelf. That spot in the home where a little bookworm can sit and read book titles. 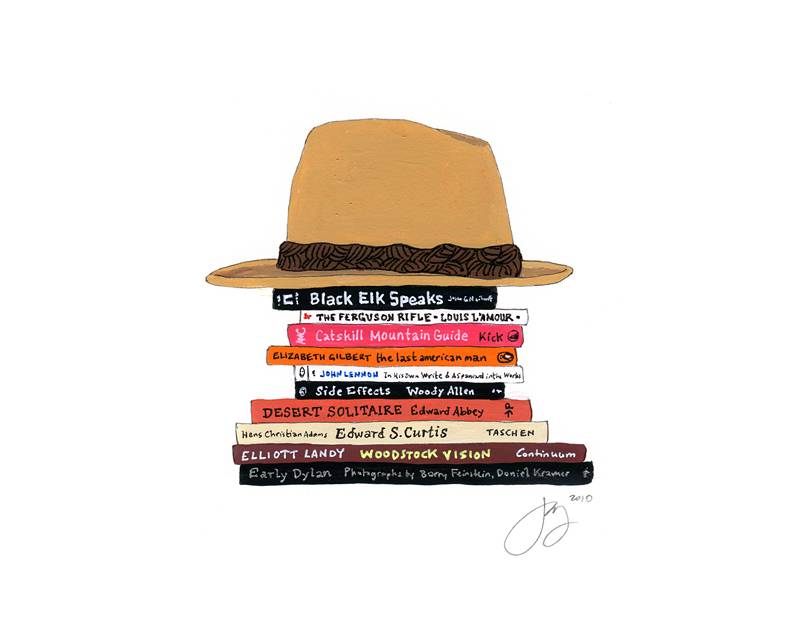 We should keep a curated selection of books we love in our homes–like a badge. This is what made me. Because books make the home. At least for me they do, I can’t feel at home in a new house until my bookshelves are up. Jane Mount has a solution. Her custom art, the “Ideal Bookshelf” speaks to that private bookshelf so many bookworms carry in their hearts. When I finally settle on my own ideal bookshelf, I’ll have one made. What books helped you fall in love with reading? What would you put on your ideal bookshelf? I like to clip inspiring articles from the paper for my family. 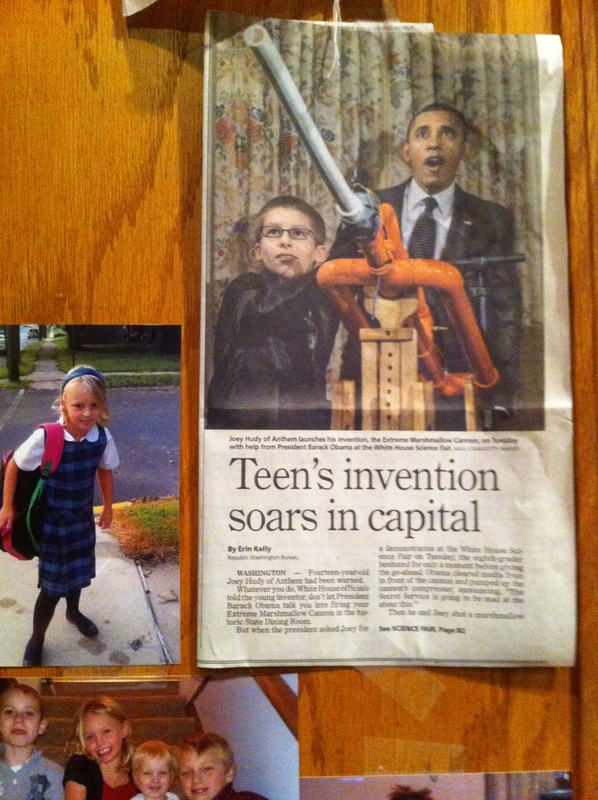 On my kitchen cabinet this week is boy, a marshmallow cannon and a president. What an inspiration for my boys and my students! 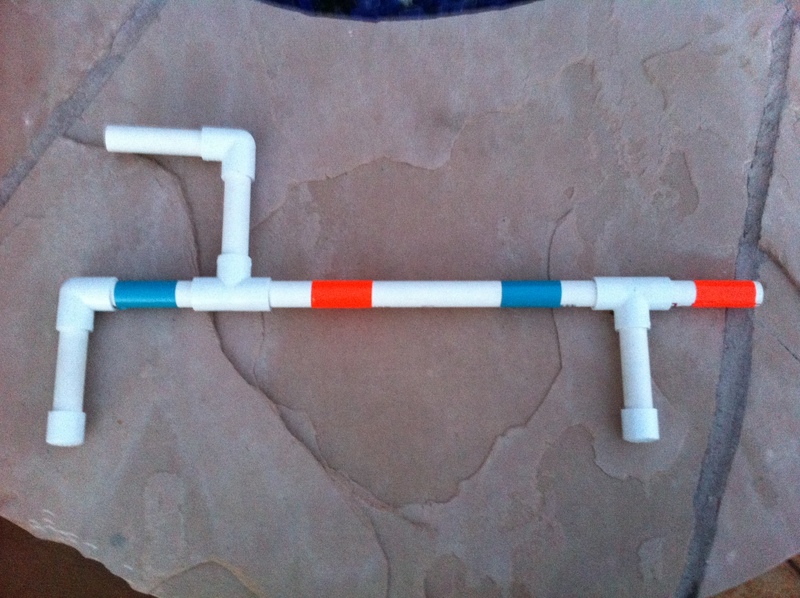 Joey Hudy of Anthem, Arizona traveled to the White House to attend the 2nd annual White House Science Fair with his invention, a high powered marshmallow cannon. So fun!! Joey, I am so proud of you. You are amazing. Keep up the good work. In the meantime, maybe I will bump into you at Heat Sync labs with my own inventors. 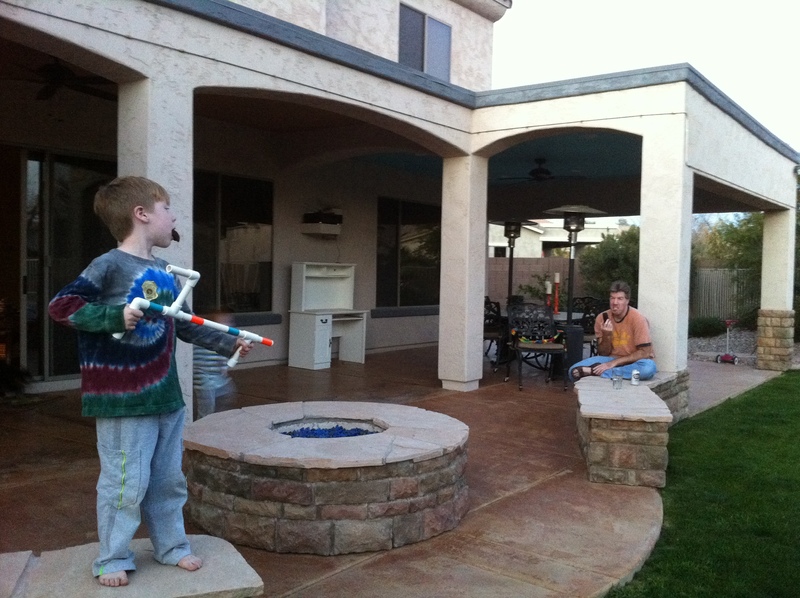 If you think Joey’s cannon is a little daunting, you can try this fun marshmallow shooter on for size.